Reprinted with permission from the Tar Heel Junior Historian, Spring 2000. Although Flora MacDonald lived in North Carolina only a short time, her legend took strong hold within the Scottish population here and has continued as an important symbol of North Carolina’s Scots history. Flora MacDonald was born in 1722 in South Uist, Scotland, to a well-placed family in the MacDonald clan. She grew up hearing many stories about Scotland’s past, including the story of King James II, a Catholic king of England and Scotland, who was removed from the throne and exiled in 1688 by Protestants who feared the influence of a Catholic king. Many Scots remained hopeful that someday King James’s son would return to lead Scotland. This son, James Francis Edward Stuart (called the Old Pretender), tried to regain the throne but failed. The burden then fell to the Old Pretender’s son, Charles Edward Stuart, called Bonnie Prince Charlie. The Scots who wished for the return of a Scottish king called themselves Jacobites, in honor of King James. They talked about the day when Bonnie Prince Charlie would return to Scotland and regain the throne. In 1745 Bonnie Prince Charlie did arrive in Scotland and quietly organized supporters. Some clans participated, and others waited to see what would happen. After a few successful battles, Prince Charles and the Jacobites suffered a horrible defeat in a bloody battle at Culloden. Following the battle, King George II of England issued orders to torture and punish those who had helped the prince. Prince Charlie needed to get out of Scotland quickly before he was killed. Flora’s family encouraged her to help get the prince to safety. This was a dangerous but brave act. According to legend, she and several other clanswomen secretly created a woman’s costume for the prince. Then, Flora traveled with Prince Charlie, whom she disguised as her maid, Betty Burke, through the Highland country and across the sea to the Isle of Skye. The English king’s men followed them closely and gave them no rest. The trip was dangerous, and they spent many days tired, hungry, and soaking wet from the Scottish rains. Flora could have left the prince and returned home, but she refused. After several weeks, the prince continued on his own and found a ship that took him to France. Flora returned home to her clan. Once home, Flora was arrested by the English and taken on a long sea journey to London, where she awaited trial. Conditions on the ship were horrible. On board, however, she charmed the crew, and the captain of the ship wrote a letter requesting that Flora be kept out of jail, since she was such a nice and charming girl. The letter worked, and Flora was kept in a private home with several other clanspeople, rather than in a jail. In London, Flora charmed those who cared for her and made many friends among English Jacobites, who came to visit her regularly. The English Jacobites knew Flora’s story and felt privileged to spend time with such a brave young woman. Flora returned home two years later with many friends and a sizable fortune raised for her by the English Jacobites. She never stood trial. After returning home, Flora married Allan MacDonald, also of the clan MacDonald. They lived in Scotland for many years and had seven children. The family went into great debt because of high land rents and bad weather that ruined their crops. Things were desperate for the MacDonalds and many others throughout Scotland. In 1774 Flora and Allan emigrated to North Carolina, where they believed they could begin a better life. The MacDonalds arrived in Wilmington in the fall of 1774. There, they found a substantial Scottish population, most members of whom were aware of Flora MacDonald’s efforts to save the prince. In fact, Flora was quite a heroine in North Carolina among the Scots. The MacDonalds soon learned about the growing conflict between colonists and King George III. Although they tried to stay out of the trouble, eventually everyone had to choose a side. Since Allan MacDonald had signed an oath of loyalty to England in order to receive a military commission, the MacDonalds decided to remain loyal to the king. This decision was the end of their joy in North Carolina. In 1775 royal governor Josiah Martin tried to raise a small North Carolina Highland regiment to fight the Patriots, and he included Allan MacDonald. In February of 1776, a small unit of fewer than five hundred Highlanders, along with other Loyalists, departed for the coast to join the British army. One legend of Flora tells of how she saw the Highland unit off. “On the public square, near the royal standard, in Gaelic, she made a powerful address, with all her power, exhibiting her genius she dwelt at length upon the loyalty of the Scots, their bravery, and the sacrifices her people had made. She urged them to duty, and was successful in exciting all to a high military pitch.” She then mounted her snow-white horse, bade her husband farewell, and returned to her plantation. No one knows for sure if this story is true, but it continues to be popular. At Moores Creek Bridge, the Highlanders encountered the Patriot forces, who had taken the planks off the bridge and greased the side rails. As the Loyalists tried to cross the bridge, Patriot soldiers shot at them and killed many. The entire ordeal lasted only a few minutes, but the Loyalists lost the battle. Flora MacDonald was devastated—her life in North Carolina had come to a close before it had really begun. Following the defeat at Moores Creek, Allan MacDonald and one of Flora’s sons were jailed in North Carolina and, later, in Philadelphia. Flora had to face the anger and violence of local Patriots with the help of her remaining son. Their plantation was robbed, and she fled to her daughter’s home nearby. A disappointed Allan and Flora eventually left America for Nova Scotia. The following year, Flora and Allan returned to Scotland to live the remainder of their lives. After living through glory and hard times, Flora MacDonald died in 1790 and was buried just two miles from the spot where she and Prince Charles reached safety in 1746. Her legend, however, continues today as a story of bravery, romance, and loyalty. At the time of the article’s publication, Deanna Kerrigan was outreach programs supervisor at the North Carolina Museum of History. MacDonald, Jonathan. 1989. Flora MacDonald: heroine of the Jacobite cause. Duntulm, Skye: J.
Jolly, William. 1886. Flora Macdonald in Uist. A study of the heroine in her native surroundings. Brown, Duncan. "Flora MacDonald" Iverness Castle, Scotland, statue unvieled 1899." Located at http://www.flickr.com/photos/cradlehall/5583532352/. Accessed March 5, 2012. Brock, Vicky. November 25, 2006. 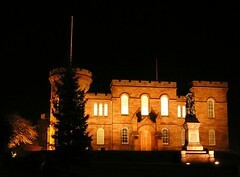 "Inverness Castle, Scotland." Located at http://www.flickr.com/photos/vickyb/305760220/. Accessed March 5, 2012. Check out this painting discovery of Flora MacDonald and other discoveries. Thank you so much for sharing this with NCpedia readers! After recently visiting the grave of Flora MacDonald on the Isle of Skye and reading more details of this amazing woman's life I am wondering if there is a movie? It would be a blockbuster. Thanks for visiting NCpedia. We've done a little searching and as far as we know, a film hasn't been made about Flora MacDonald. But if you hear of one, let us know!